What do Edgar Allan Poe and Benjamin Franklin have in common? Both made Philadelphia their home in their contribution to art and science. 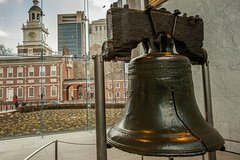 Your day trip from New York City to Philadelphia includes round-trip train tickets, a hop-on hop-off bus tour and lunch, so grab your family and let's go! Philadelphia, the City of Brotherly Love, welcomes you on a special one-day visit. Depart on the early train from Pennsylvania Station New York and in under 2 hours you'll be at Philadelphia's 30th Street station, just blocks away from some of the most iconic historic sites in America. After a day of shopping, dining and sightseeing, walk around historic 30th Street rail station and enjoy some coffee and pastries before your relaxing rail trip back to New York City. Also included is a Dine4Less card to enjoy during your time in New York.